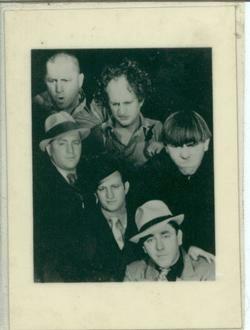 Here is a 5X4 3 Stooges photograph with a handwritten signed note on the reverse by Moe Howard in full; "Dear Linda, Mr Melvin Jacobs of the Technicolor Corp has kindly consented to send you some very important items. He's a doll and we all love him out here. Hope you enjoy it all. Love Moe." 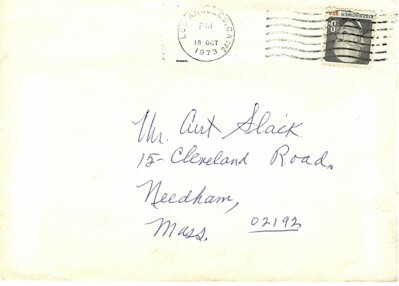 Tape to the back affecting some of his writing but not his signature. 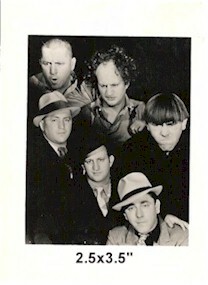 On the front are pre printed and secretarially signed signatures of the three stooges with more tape stuck to the front. 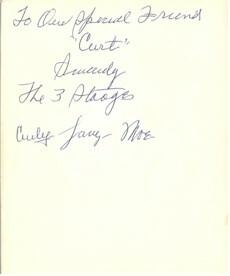 Moe's authentic letter and signature on back. 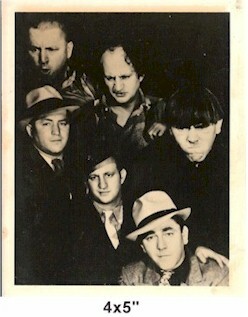 In this 2 1/2" x 3 1/2" photo the stooges are double exposed. The comic trio are portrayed as their screen characters apparently scowling down on their alter ego street personas. 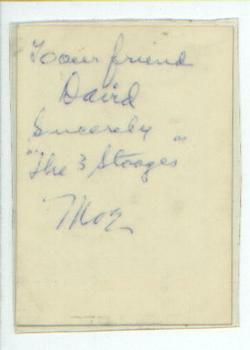 The inscription on the back reads " To our friend David, Sincerely "The Three Stooges" MOE. This piece has been laminated on the front and back and is in very good condition. We believe this may be secretarial signed, but a great vintage photo nevertheless. 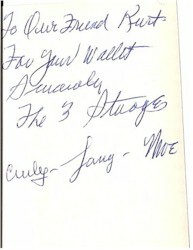 Collection from a long time fan who wrote to Moe Howard in the 70's. Two signed photos, 4" x 5" photo and 2.5"x3.5" the stooges are double exposed. The comic trio are portrayed as their screen characters apparently scowling down on their alter ego street personas. The inscriptions on the back are to the same person "Kurt" . NICE vintage photo in very good condition. 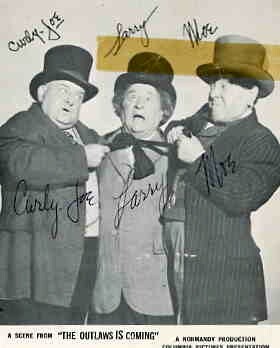 We believe they may be secretarial signed, but a great pair of Stooge vintage photos nevertheless. What is interesting is that the envelop is 100% ALL in Moe's Hand. !! $195 for collection including handwritten envelop by Moe.